2014 Audi A8 facelift comes with new range of engine options and the innovative Matrix LED headlights. With these headlights, the high-beam unit is made up of 25 individual segments. Additional features of the new headlights are the intelligent cornering light, new-look daytime running lights and dynamic turn signals. The LED lights at the rear of the new Audi A8 have also become flatter and are joined together by a continuous chrome strip. There is a choice of 12 exterior colors, including five new ones. Wheels are available in sizes up to 21 inches with 275/35-series tires. Under the hood of the A8 3.0 TFSI quattro is a V6 engine whose mechanical compressor can be deactivated. Power output is now 228 kW (310 hp), an increase of 15 kW (20 hp). The V6 accelerates the standard wheelbase version of the sedan from 0 to 100 km/h (62.14 mph) in 5.7 seconds. 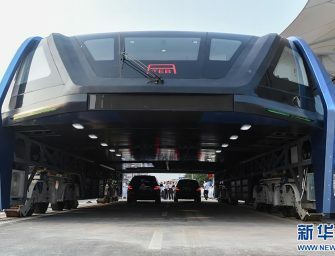 Top speed is electronically restricted to 250 km/h (155.34 mph). The twin-turbo V8 in the A8 4.0 TFSI quattro now produces 320 kW (435 hp), 11 kW (15 hp) more than before. Key performance data: from 0 to 100 km/h (62.14 mph) in 4.5 seconds; average fuel consumption 9.1 liters per 100 kilometers (25.85 US mpg), corresponding to 213 grams CO2 per kilometer (342.79 g/mile). The V6 diesel engine’s output has been bumped up 6 kW (8 hp) to 190 kW (258 hp). It now accelerates the sedan from 0 to 100 km/h (62.14 mph) in 5.9 seconds. The 4.2 TDI clean diesel tops the A8 lineup, delivering 850 Nm (626.93 lb-ft) to the crankshaft. Audi has boosted its output by a whopping 25 kW (34 hp) to 283 kW (385 hp). Equipped with the powerful V8 diesel, the A8 completes the standard sprint in 4.7 seconds, and average fuel consumption is 7.4 liters per 100 kilometers (31.79 US mpg), which corresponds to 194 grams CO2 per kilometer (312.21 g/mile). All variants of the model series are equipped with a fast and smooth-shifting, eight-speed tiptronic. Audi will combine quattro all-wheel drive with the optional sport differential on the rear axle. The Bang & Olufsen Advanced Sound System that sends over 1,400 watts of power to 19 speakers provides for good sound. The rear seat entertainment system for the passengers in the back includes two large displays, Bluetooth headphones and a DVD player. Audi A8 L W12 quattro is equipped with a powerful gasoline engine that is particularly short and lightweight thanks to its W layout. The normally aspirated, 6.3-liter engine produces 368 kW (500 hp), yet is very smooth-running. The sprint from 0 to 100 km/h (62.14 mph) takes just 4.7 seconds. The Audi A8 L W12 quattro is available exclusively with the long wheelbase. Its luxurious features include MMI navigation plus with MMI touch, Audi connect including car phone, LED headlights, power door closing assist, convenience key, four-zone automatic air conditioning, individual rear seats. The limited-edition package (50 cars) is available for the A8 L W12 quattro. Leather from Italian furniture manufacturer Poltrona Frau in the color Agatha cognac dominates the interior. The inlays are made of fine grain olive ash natural silver brown. Its gray-brown shade harmonizes with the granite gray piping on the seats. Audi recommends the color Tierra Del Fuego for the exterior finish. [toggle title=”Press Release”]Superior design, hand-built quality, systematic lightweight constructionand an abundance of high-end technologies: Audi presents the comprehensively updated A8, its successful flagship, at the IAA in Frankfurt am Main. The engine lineup has once again become more powerful and efficient; new assistance systems and the innovative Matrix LED headlights make driving more composed than ever. B-pillars is made entirely of aluminum. An Audi Space Frame (ASF) design, it tips the scales at just 231 kilograms (509.27 lb), roughly 40 percent less than a comparable steel construction. The ASF body also makes it possible to reduce weight in many other areas, from the brakes to the fuel tank. Length (5.14 meters [16.86 ft]), wheelbase (2.99 meters [9.81 ft]), width (1.95 meters [6.40 ft]) and height (1.46 meters [4.79 ft]) remain unchanged, giving the Audi A8 the sportiest look in the segment. The A8 L gains an additional 13 centimeters (5.12 in) in both length and wheelbase. Equipped with a TDI engine, both body variants have a drag coefficient of just 0.26. This same figure with a TFSI engine is 0.27. In updating the A8, Audi paid great attention to the acoustics. Additional noisedamping measures reduce the already low interior noise level even further. The trunk now has a maximum of 520 liters (18.36 cubic feet) and can be loadedsubstantially better thanks to the altered layout. The optional power trunk closingassist means that the entire car can be locked at the touch of a button. Dynamic, yet harmoniously elegant – the big sedan’s design has become even more expressive. The engine hood, the single-frame grille and the front bumper are even more sculptured and precise; the lower edge of the headlights is straight. In the German market, LED headlights are standard in all models with a V8 engine. Audi also offers the headlights with optional Matrix LED technology, which sets new benchmarks with respect to design and technology. With these headlights, the highbeam unit is made up of 25 individual segments. The small light-emitting diodes, which work in conjunction with lenses and reflectors connected in series, are activated and deactivated or dimmed individually according to the situation. This enables the system to react precisely to other cars, which it recognizes using a camera, and always illuminate the road brightly. Additional features of the new headlights are the intelligent cornering light, new-look daytime running lights and dynamic turn signals. The LED lights at the rear of the new Audi A8 have also become flatter and are joined together by a continuous chrome strip. In all models except the S8, the redesigned bumper houses two rhomboid tailpipes. Chrome strips in the lower section of the body, fine inserts in the door handles and high-gloss black window frames round out the distinctive features. There is a choice of 12 exterior colors, including five new ones. Wheels are available in sizes up to 21 inches with 275/35-series tires. The engines: more power with greater efficiency Besides the S8, A8 L W12 quattro and A8 hybrid models, the new Audi A8 will be offered in the German market with two TFSI gasoline engines and two TDI units. A package of measures to reduce friction reduce fuel consumption by as much as ten percent, and most engines have also seen an increase in power. All engines alreadysatisfy the requirements of the Euro 6 standard. Under the hood of the A8 3.0 TFSI quattro is a V6 engine whose mechanical compressor can be deactivated. Power output is now 228 kW (310 hp), an increase of 15 kW (20 hp). The V6 accelerates the standard wheelbase version of the sedan from 0 to 100 km/h (62.14 mph) in 5.7 seconds. Top speed is electronically restricted to 250 km/h (155.34 mph).It consumes on average 7.8 liters per 100 kilometers (30.16 US mpg), corresponding to 183 grams CO2 per kilometer (294.51 g/mile). The twin-turbo V8 in the A8 4.0 TFSI quattro now produces 320 kW (435 hp), 11 kW (15 hp) more than before. Key performance data: from 0 to 100 km/h (62.14 mph) in 4.5 seconds; average fuel consumption 9.1 liters per 100 kilometers (25.85 US mpg), corresponding to 213 grams CO2 per kilometer (342.79 g/mile). The Audi cylinder on demand (COD) system plays a major role in this efficiency by deactivating four of the eight cylinders under part load. With average fuel consumption of 5.9 liters per 100 kilometers (39.87 US mpg), corresponding to 155 grams CO2 per kilometer (249.45 g/mile), the 3.0 TDI clean diesel set a new record in the all-wheel-drive luxury segment. The V6 diesel engine’s output has been bumped up 6 kW (8 hp) to 190 kW (258 hp). It now accelerates the sedan from 0 to 100 km/h (62.14 mph) in 5.9 seconds. When it comes to torque, the 4.2 TDI clean diesel tops the A8 lineup, delivering 850 Nm (626.93 lb-ft) to the crankshaft. Audi has boosted its output by a whopping 25 kW (34 hp) to 283 kW (385 hp). Equipped with the powerful V8 diesel, the A8 completes the standard sprint in 4.7 seconds, and average fuel consumption is 7.4 liters per 100 kilometers (31.79 US mpg), which corresponds to 194 grams CO2 per kilometer (312.21 g/mile). Powertrain: tiptronic and quattro All variants of the model series are equipped with a fast and smooth-shifting, eight-speed tiptronic. The transmission, which can be controlled electronically usingan elegant selector lever as well as paddles on the steering wheel, works in conjunction with the quattro permanent all-wheel drive system. The latter is standardin the A8 series (except for the A8 hybrid). If desired, Audi will combine quattro allwheel drive with the optional sport differential on the rear axle. The power can then be distributed between the rear wheels as needed for even more agile handling. 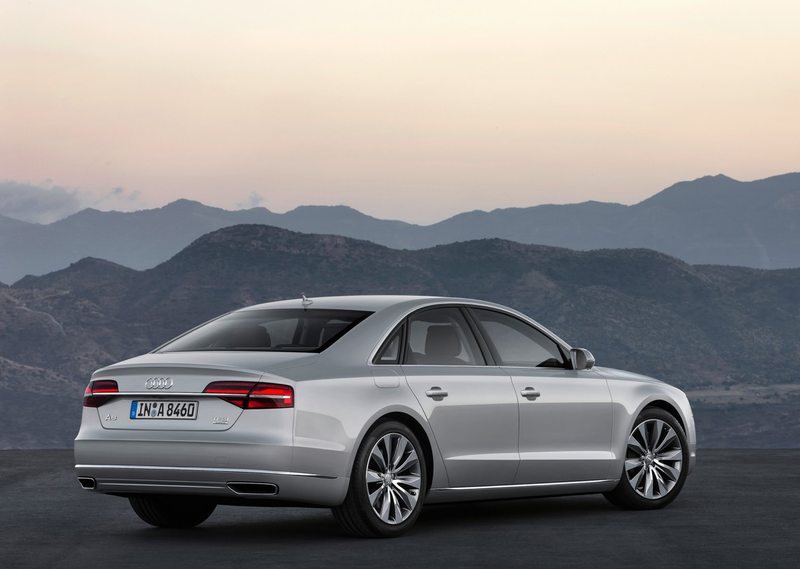 The sport differential is standard in the S8 and the A8 4.2 TDI clean diesel quattro. The Audi A8 owes its sporty character in large part to the sophisticated chassis. Axle load distribution is balanced, and all wheel control arms are aluminum. The Audi drive select system, which enables the driver to influence the function of various technical modules such as the steering and the accelerator characteristic, is standard. It also controls the adaptive air suspension with adaptive damping, which adjusts the body’s ride height to the speed driven. Audi also offers the air suspension with a sporty setup upon request. The power steering now uses an efficient electromechanical drive that reduces fuel consumption and also enables the use of numerous assistance systems. The optional dynamic steering varies its ratio with the car’s speed. All brake discs are internally vented. Carbon fiber ceramic brake discs are available for V8 models, the S8 and the A8 L W12. One new component of Audi’s lightweight construction technology are the 9J x 20 aluminum-technology wheels. These are based on forged support wheels that are joined via a special process to a ten-spoke design element of high-strength polymer. This technology gives designers the freedom to use large-area, yet threedimensional designs. The interior of the Audi flagship enchants with its elegant, airy lines. The instrument panel is lean and low, and below the windshield is a long arc – the wrap-around. Space is generous in every seat. The broad range of options for the front seats include sventilation and massage functions with five programs and intensities each. Audi offers electrically adjustable, individual rear seats as an option for the A8 andthe A8 L. The A8 L is also available with a continuous, leather-covered center console.Equipped with every available luxury feature, the relaxation seat with electrically adjustable footrest is the first-class solution here. 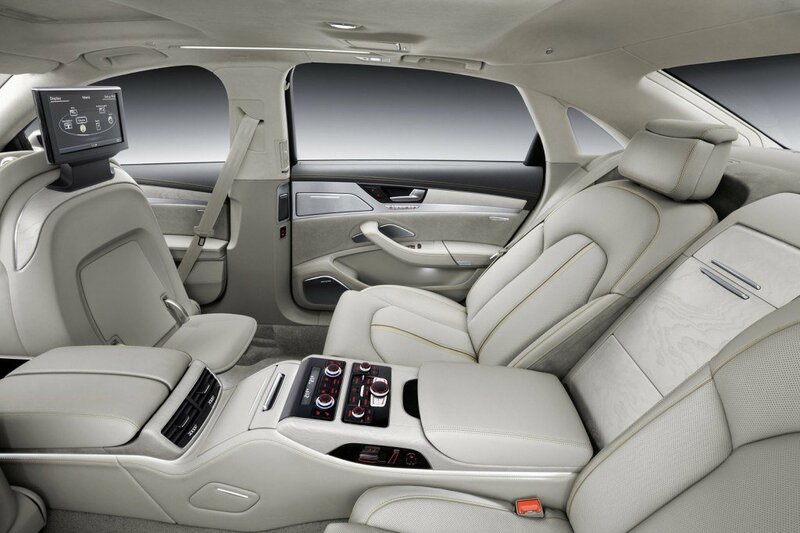 Among the numerous individual options available for the A8 family are four-zone deluxe automatic air conditioning, the panorama glass roof, convenience key with power door closing assist, privacy windows, a cooler, folding tables and an ionizer to improve air quality. Audi quality knows no compromise. All of the materials in the new A8 have been carefully chosen and precisely worked. Lovingly executed details document thehand-built character, from the barely visible gaps in the two-piece inlays to theambient lighting with its adjustable LED light to the seat covers in premium grades of leather. The best of these is the new Unicum leather in nutmeg brown, which is particularly natural-looking, soft and breathable. A new range of choices for seat coverings, inlays and interior colors is available in many areas. New additions include the woods Fine grain poplar brown-silver and Fine grain ash natural gold-brown, whose fine pores are filled with small amounts of silver and gold, respectively. Audi design selection offers customers an aesthetic pre-selection of exclusive materials and colors for the interior, including sycamore gray, marble gray and vermont brown for the S8. The Audi exclusive range offers an even greater degree of individualization for particularly discerning customers. As is typical for Audi, the brand’s flagship features exemplarily clear controls despite the abundance of functions. The driver information system with color seven-inch display and the eight-inch MMI monitor are standard. If the optional MMI navigation plus is installed, the control element on the center tunnel console includes a touchpad. The MMI touchpad enables the driver to control numerous functions; for example, the navigation destination can be entered by tracing the letters on the pad. Audi connect including car phone is available as an ideal extension of MMI navigation plus. It connects the new A8 to the Internet via an integrated UMTS module. Thanks to the WLAN hotspot, passengers can surf and e-mail freely with their mobile devices. For the driver, the system delivers the tailored online services from Audi connect to the car, including online traffic information with real-time data and navigation with Google Earth and Google Street View. In the area of multimedia, the Bang & Olufsen Advanced Sound System that sends over 1,400 watts of power to 19 speakers provides for good sound. The rear seat entertainment system for the passengers in the back includes two large displays, Bluetooth headphones and a DVD player, among other things. The MMI navigation system is closely networked with additional systems on board the Audi A8, including the optional adaptive cruise control with stop&go function. The radar-based cruise control itself is linked with an expanded version of the standard Audi pre sense basic safety system, as is another optional system, Audi side assist. The camera-based speed limit display is also available. New assistance systems are making their debuts in the new A8, including Audi active lane assist, which makes slight steering adjustments when necessary, and the park assist system with 360° display, which handles steering when parking. Also new is the head-up display, which is elegantly integrated into the instrument panel and projects important information into the driver’s field of vision on the windshield. The night vision assistant detects not only pedestrians, but also larger animals and warns the driver about them. The new Audi A8 is scheduled to arrive at German dealerships in November. Despite the more generous list of equipment and more powerful engines, prices are increasing only slightly. The new Audi model will be available in Germany starting at 74,500 euros. The Audi A8 L W12 quattro is equipped with a powerful gasoline engine that is particularly short and lightweight thanks to its W layout. The normally aspirated, 6.3-liter engine produces 368 kW (500 hp), yet is very smooth-running. The sprint from 0 to 100 km/h (62.14 mph) takes just 4.7 seconds. Average fuel consumption is a moderate 11.7 liters per 100 kilometers (20.10 US mpg), which corresponds to 270 grams CO2 per kilometer (434.52 g/mile) and is thus the benchmark for twelvecylinder sedans. A newly developed COD system is active at low load. It temporarily deactivates the fuel injection and ignition for six of the twelve cylinders. As the top model in the series, the Audi A8 L W12 quattro is available exclusively with the long wheelbase. Its luxurious features include MMI navigation plus with MMI touch, Audi connect including car phone, LED headlights, power door closing assist, convenience key, four-zone automatic air conditioning, individual rear seats and noise-insulating glazing. An innovative absorber foam in the tires reduces rolling noise. For the first time Audi is also offering Active Noise Cancellation (ANC) in the W12 so that the top model retains its quiet composure even when the Audi cylinder on demand system is operating in efficient six-cylinder mode. The A8 Audi exclusive concept is intended for customers looking for something very special. The limited-edition package (50 cars) is available for the A8 L W12 quattro. Leather from Italian furniture manufacturer Poltrona Frau in the color Agatha cognac dominates the interior. The inlays are made of fine grain olive ash natural silver brown. Its gray-brown shade harmonizes with the granite gray piping on the seats. Audi recommends the color Tierra Del Fuego for the exterior finish.